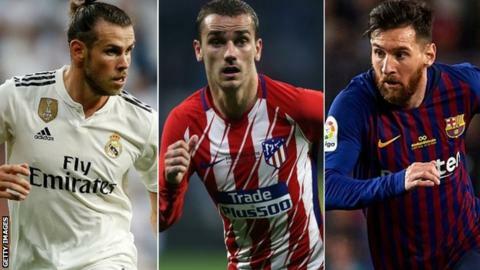 The new La Liga season gets under way this weekend amid plenty of intrigue, especially for Real Madrid - as the three-in-a-row European champions begin life without iconic duo Cristiano Ronaldo and Zinedine Zidane. Real are by no means the only team going through a period of change, however, with similar - although less dramatic - transitions being experienced by their biggest rivals, Atletico Madrid and domestic champions Barcelona. The level of uncertainty surrounding the big three has raised excitement levels about the new campaign, and the least heralded club of the trio are now most strongly positioned as the season dawns. And Atletico struck an early-season blow against one of their major rivals with a 4-2 win over Real in Wednesday's Uefa Super Cup. What next for Real without Ronaldo and Zidane? Overseeing the new era at Real is coach Julen Lopetegui, who was controversially fired by Spain two days before the World Cup after agreeing to move to the Bernabeu without - according to the Spanish Football Federation - notifying his then-employers of his intentions. Lopetegui's first task is to figure out how to reshape Real's attacking play without Ronaldo, and the most notable aspect of the summer has been the club's failure to sign a direct replacement. There is still time, with the Spanish transfer window open until the end of the month, and it is possible that Real will make a move for Mauro Icardi from Inter Milan, Rodrigo from Valencia or, although it currently seems unlikely, Neymar or Kylian Mbappe from Paris St-Germain. Or even Eden Hazard from Chelsea. Who will be Real Madrid's next galactico? For now, though, it appears that Lopetegui is ready to persist with Karim Benzema at the head of his favoured 4-3-3 formation, with Marco Asensio and Gareth Bale benefiting from Ronaldo's departure to become starters in the wide attacking positions. One key player for Real this season will surely be Isco, whose personal history with Lopetegui dates back to winning the European Under-21 title together in 2013. The coach has remained a huge admirer of the midfield conjuror ever since, and this season should finally give Isco the opportunity to take centre stage under the guidance of a boss who trusts him completely. Unless a new striker is signed, the main selection decision for Lopetegui is whether to stick with Keylor Navas in goal or replace him with newly signed Thibaut Courtois, although the option of job-sharing - one for La Liga, the other for cup competitions - has also been touted. However, rather than personnel or playing systems, the biggest doubt hanging over Real is Lopetegui's lack of top-level club management experience, aside from a disappointing stint in charge of Porto. Predecessor Zidane's only prior managerial experience was with Real's B team. But Zidane was a Real legend and Lopetegui has no Ronaldo to bail him out, so it remains to be seen how he will cope - especially as many fans and members of the media appear ready to turn against him following his perceived "desertion" of the national team before the World Cup. Whatever happens, his first season in charge won't be dull. Could reinforced Atletico take advantage of rivals' changes? Real face a serious challenge from city rivals Atletico, a point emphasised by the Rojiblancos' extra-time victory in Tallinn on Wednesday. It has been an outstanding summer in the transfer market for Diego Simeone, who can now call upon arguably a far stronger squad than the side that won the title back in 2014. Most significantly, Atletico have succeeded in keeping hold of three key players, with Antoine Griezmann turning down Barcelona, Diego Godin reportedly rejecting Manchester United and outstanding goalkeeper Jan Oblak dismissing interest from an array of suitors. That has never really happened before to Atletico, who were accustomed to losing their biggest talents to more powerful rivals, and the fact that the Rojiblancos can turn away such major offers suggests a turning point has been reached in terms of their status within the elite. They have also strengthened, with the addition of defensive midfielder Rodri looking a particularly good piece of business - the 22-year-old is on the fringes of the Spain squad after an outstanding season with Villarreal, and is widely regarded as the eventual heir to Sergio Busquets in the national team. Atletico should also be more dangerous going forward following the acquisition of Thomas Lemar and Gelson Martins to provide more ammunition for Griezmann and Diego Costa, while Croatian striker Nikola Kalinic has been added for another muscular option. With a reinforced attack, a versatile midfield, a rock-solid defence and Simeone's know-how, it appears Atletico have everything in place to challenge for silverware - especially considering the enticing prospect of the Champions League final being staged in their own Wanda Metropolitano stadium. Mention of the Champions League final inevitably turns attention to reigning league champions Barcelona, who are focusing more of their efforts than ever on regaining European supremacy. An embarrassing exit at Roma in April, when they squandered a 4-1 first leg lead, was the third successive quarter-final elimination for Lionel Messi and co, and for a club with such lofty aspirations that just isn't good enough - especially with Real enjoying so much success on the continental stage. Barca's problem in the past couple of seasons has been a lack of squad depth, which has led to key players being selected week after week and becoming jaded by the time of the knockout rounds. Stats prove the point: six Barca players made at least 30 league starts last season (Marc-Andre ter Stegen, Jordi Alba, Sergio Busquets, Ivan Rakitic, Luis Suarez and Messi), whereas only one Real player did so (Casemiro). The conclusion at the Nou Camp is that to challenge more effectively in Europe, manager Ernesto Valverde needs to rotate his starting XI more often. To achieve that aim, Barca have been busy in the transfer market. The midfield has been particularly refreshed, partly necessitated by the departures of Andres Iniesta and Paulinho, and Valverde will be expected to regularly use new signings Malcom, Arthur and Arturo Vidal rather than leaving them on the bench and constantly turning to Rakitic and Busquets. And, of course, if the Catalan club succeed in their optimistic ambition of luring Paul Pogba away from Manchester United, yet another new dimension will be added to their midfield. The attack will be powered by new captain Messi, his favourite ally Luis Suarez and Philippe Coutinho, but there is also a sense that Ousmane Dembele is ready to enjoy a breakout season after an injury-disrupted campaign in 2017-18. Dembele's electrifying talent is not in doubt, but last season he struggled within the team framework built by Valverde. The new campaign has shown promise, though, with the young Frenchman producing a superb strike to secure the Spanish Super Cup against Sevilla on Sunday. If that is a sign of things to come, Barca should be tough to beat. Away from the title contenders, another team well worth watching this season are Real Betis. After a fallow few years, the Seville club are emerging as a force under coach Quique Setien, whose purist principles made his team a joy to watch during his first season in charge. 3-5, 5-3, 0-5, 3-2, 4-4, 3-6… they were just some of the scorelines in Betis games last season, but there was also plenty of substance to go with the entertainment as Setien took his team to a sixth-place finish - their highest since 2005. The summer arrivals of powerhouse Portuguese midfielder William Carvalho and dynamic Japanese winger Takashi Inui have sparked expectations that Betis could reach even greater heights, especially if rising star Loren Moron can continue the progress that saw him light up the league after being introduced to the team's attack in February. Across the city, Sevilla face an intriguing campaign under new manager Pablo Machin, who forged his reputation by leading minnows Girona into the top flight with an exhilarating brand of football, while Villarreal will also hope to mount a top-four challenge after reinvigorating their attack with the re-signing of Gerard Moreno from Espanyol. Also keep an eye on Valencia, who emerged from a dark period with a vibrant season under demanding coach Marcelino last time around, and will be looking to make further progress following several eye-catching summer signings, including a loan move for Chelsea striker Michy Batshuayi. With the changes at the top three and the potential for improvement of several teams below them, it all adds up to a fascinating season in La Liga - and perhaps the most open and competitive in many years.